Port Everglades sits on the Southeastern coast of Florida and is home to cruise, cargo, and foreign trade ships. As part of the Greater Fort Lauderdale area, Port Everglades has proven itself to be not only a place of marine commerce, but a veritable world trade center that offers culture, history, municipal services, and a starting and ending points for cruise ships. You can always count on the steady influx of commercial trucks and general traffic in Port Everglades. With the transfer of hazardous materials to and from trucks and loading docks, as well as the frenetic pace of diners, history goers, and folks rushing to board cruise ships, there is much potential for injury, crashes, and worse. While we are certain that the vast majority of drivers both in and around Port Everglades drive safely, crashes still occur. The chances of such accidents, given the volume of trucks transporting hazardous or flammable goods in the region, is further aggravated by the heavy storms and hurricanes that often hit this locale. The chances of car accidents in Fort Lauderdale and Port Everglades are further compounded when you add into the risk equation the slick oil that inevitably drips from even the best maintained vehicles. Cars and trucks involved in collisions are likely to be destroyed. Given that hazardous materials are often contained in the trucks in the Port Everglades area however, car accidents that occur here are likely to cause damage to actual vehicles, as well as oil and gas explosions and projectile debris. In essence, vehicles in car accidents in this part of Fort Lauderdale are easily reduced to scraps of metal and aluminum soot. It goes without saying that vehicular accidents involving any materials, but especially those that are hazardous, are going to cause a host of physical injuries. Burns, abrasions, broken limbs, respiratory damage, loss of hearing, vision, and mobility are only some of the conditions that may result. And this does not even include the long term ramifications of these injuries. A decrease in one’s quality of life due to an inability to work, dependence on disability services and loved ones, and the possibility of brain injuries looms large, as well. Far reaching flames capable of incinerating buildings, roads, and other vehicles, as well as trees and the surrounding landscape are likely results of a car or truck accident. Not only would an accident of this magnitude in Port Everglades have the potential to be fatal, but would surely destroy the air surrounding it. The ecological and proprietary damage would simply be unthinkable. What Should You Do if You Are in a Truck Accident Near Port Everglades? Port Everglades is a hub of economic promise, fast paced loading, shipping, and sailing, and brings with it all the drivers that need to make the Port what it is. The sheer amount of movement, both on foot and vehicle, increases the likelihood of accidents, particularly with vehicles carrying all sorts of potentially deadly materials. Though our company cannot combat ecological fallout, we can guide you through the accidents that caused them. If you are in a car or truck accident in Port Everglades or Fort Lauderdale, contact a Fort Lauderdale car accident attorney so you can get the assistance, guidance, and support you deserve, especially in times like these. How much does probate cost ? contact Probate Solicitors Costs ? 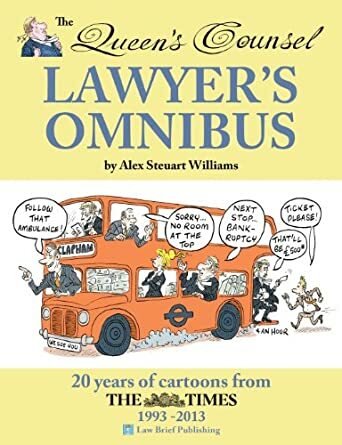 The 20th anniversary collection of the classic Queen's Counsel cartoons by Alex Williams which have featured in The Times throughout that period. Published by Law Brief Publishing.